San Fermin. Two of the greatest words in language. ‘’And so have ended the Fiestas of San Fermin…’’ Some of the most melancholy words…but so they sang, and we sang too, with the closing ‘Pobre-De-Mi’ ceremony, as this year’s Fiesta faded explosively away – only in Pamplona can something fade away ‘explosively!’ – and thus the unbridled anticipation of July 5th gave way to the exhausted calm of July 15th. And personally, due to circumstances, I have not had such a San Fermin in a feria long time, (gawd-awful pun…sorry!) Actually, not so much as ‘in a very long time’, but ever, in a way, as something special happened which I’ll come back to at the end of this piece, as it involves me and I usually prefer not to be the centre of attention but to participate, and be involved in, and then be swamped and finally submergedby fiesta. But first things first. Along with the melancholy of saying goodbye to fiesta, we also had the sadness of saying adios, (hopefully, actually, just ‘hasta luego’) at a special Mass, to three true Sanfermineros who left us over the year. More of which below. And then, at the end of August, came the shocking and incomprehensible news of the oh-so-sudden and unexpected passing of that great running man, Julen Madina. 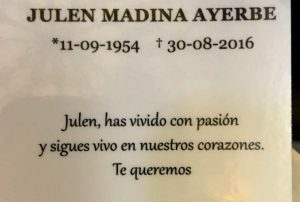 Some events are just unthinkable in their shocking “I just can’t believe it” suddenness, and Julen’s death was one of those. I didn’t know him too well but had a wonderful chat with him at Bar Txoko this year after one of the runs, and all I can say is he was on top form, with his personality, charm and charisma shining through. He was more interested in me than talking about himself. I may write more about him another time, but I did do a piece on him for these pages, after I’d had a long telephone conversation with him a couple of years ago, and, for those who are interested, you can read it here. Julen Madina. Un corredor sin igual. However, some words have to be said, and I shall leave them to his great friend Joe Distler. These words are not something Joe wrote after deep thought, for some newspaper or magazine, rather they were straight from the heart and direct off the cuff comments to me in a private email after Julen’s death. So with his direct permission…take it away, Joe. ‘As for Julen I have been in a state of total depression since he died. We had run together for over 40 years since we were practically kids. He was one of the first Spanish runners to recognize us as equals. This means nothing to young runners today but for years the Spanish, except for Atanasio, looked down on us. Miguel Angel Eguiluz, Chema Esparza, Jokin Zuasti, Javier Solano (yes, he was a good runner before becoming the voice of encierro,) Antonio Campeon and Julen came up to me one day before the run and one after another wished me “suerte”. It was like receiving the Academy Award. Hard to realize how important that was to us as foreign runners. Then I was the first foreigner ever invited to the Runners’ Breakfast at Casa Paco on the 14th, followed by Jim Hollander and now we outnumber the Spaniards. Over the years the friendships we have made with our Spanish bull running friends in Pamplona have become an important part of our lives. 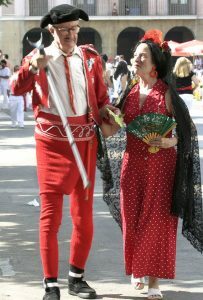 There is a mutual respect and understanding of living all the traditions of the encierro and sharing great moments both in the streets and elsewhere. All of us who run will cherish Julen as one of the great Maestros of all time and a run will not go by when we won’t think of him. 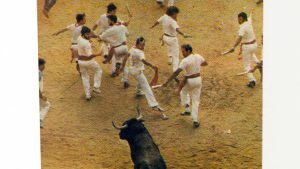 If Julen had died on the horns of a bull I would have been sad but not destroyed as we all know what dangers lies in running. But for a powerful force like him to go the way he did is debilitating. I had spoken to him three days before he died, talking about his recovery from being gored a few weeks before. He and his new Lady were planning on visiting me in my home in La Villajoyosa. I am weak even writing this as I am so affected by his death. And now, after that truly moving tribute, back to the article. Normally, as I said, I try not to stand out, so let’s start with a wee message to one very important person, who, as I said at one point pre-fiesta at a rather surprise event I was invited to participate in, “wasn’t exactly here, but is around here.” I’d arrived in town for one night on Friday 1st July, and the city’s band, La Pamplonesa, were having a pre-fiesta concert in front of the town hall that evening, to be followed by some local singing and dancing with Navarran jotas. A little clip of La Pamplonesa, Friday 1st July 2016. The whole concert’s at the end, for those like me who love ‘em! It was a proper concert too, with a big stage for the band, (it’s a big band.) Along with Director J. Vicent Egea, there are 46 musicians. That makes them bigger than The Rolling Stones! Hundreds of chairs were laid out for people to sit on with many others standing around or dancing, all enjoying the music. Little did I know that it had been arranged that I be invited onto the stage (see? Pamplona – they grab you and make you a part of them) to say a few words to everyone, between the end of the band playing the concert and the start of the jotas. This was all down to being chosen by Kukuxumusu to be awarded their ‘Guiri del Año’ – Foreigner of the Year – prize. (More of which later, due to the previously mentioned unease with ’me, centre of attention, media stuff, etc.’) Gracias Manuman, for arranging that little bit of public speaking…you may be a cross-dressing six and a half foot tall blue bull sometimes but you’re also a cabron! So beware, Mr. Testis, because my revenge will be sweet… If you ever see me with a large pair of scissors, you’d better start running ‘cos I’m going to de-cojon you. Oh, by the way, I’d also like to say thanks to Laly Jausoro and Jacobo Roura Formoso. Laly had something to do with all concert stuff and my culo being dragged up on stage to make my wee speech, (and she was the singer during the folk lore part of the concert) and she helped me just feel at ease, while Jacobo, with his calm presence and reassuring sense of ‘it’ll be alright on the night,’ (plus the supply of the odd beer or two!) helped settle any nerves I had left. Osasuna, guiriak! However, “unaccustomed as I am to public speaking” etc, but having been in town at that stage for several hours I was by then fortified by some of the local medicine, (hic) so it all went okay. Even the song I attempted to sing. I kid you not… Well, they didn’t lynch me. But then, they couldn’t catch me… In all seriousness actually, folks, never in my wildest imaginings could I ever have dreamt that I’d be standing on a stage in front of Pamplona’s iconic Town Hall, before Fiesta, making a speech to hundreds of people after La Pamplonesa had played, and with some Navarran folklore singers and dancers. I have been in Dreamland and it is beautiful. Oh, and did I write earlier ‘a wee message to one very important person?’ Wrong. To THE most important person. And luckily, at the end of my little speech (again – ‘cos I just like saying it – on stage, with the lit up Town Hall behind me…wonderful, I never could have imagined I’d be doing something like that in my beloved Pamplona,) I did actually remember to mention the fella. Okay, I know, it’s me…but I have to. What a pleasure and an honour. 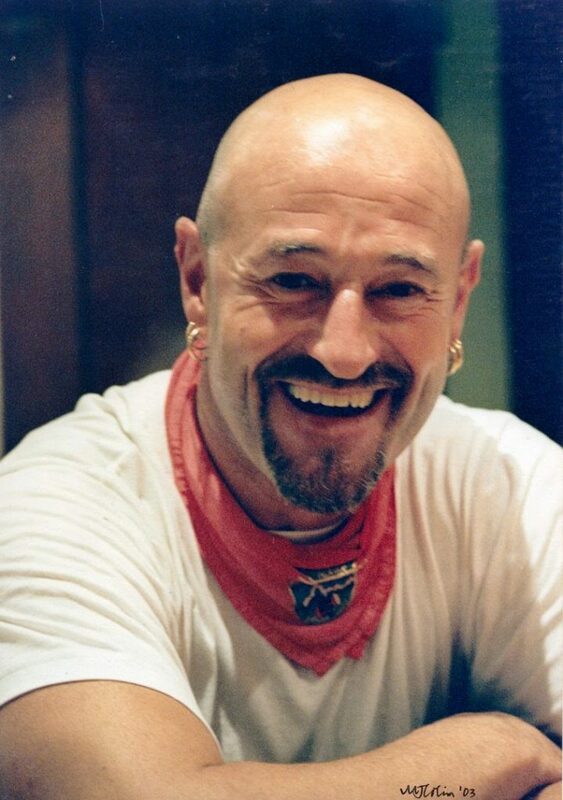 So to mi amigo Fermin, my friend, our friend: Please keep giving us your fiesta, San Fermin, please keep trying to protect us with your cloak, oh Holy Man, and please keep covering the town with your alegria, your happiness, you magic man. Some people say you never existed, some say that even if you did, you’re dead now…but I believe differently. For exist you did and dead you are not. For I have seen the ghosts of fiestas past dancing up on the hill by the Church of San Fermin de Aldapa, (I have you know, folks, and I can prove it, for I see them often.) And, amigos, I have no doubt that our fabled saint is among them. After all, why wouldn’t he be dancing at his own party? Just come along with me during fiesta one darkness hour and I’ll show you some middle-of-the-night ghostly magic. Sentimental poppycock perhaps? No. Not so much sentimentality as just San Fermintality and friendly fiesta sorcery. So to my friend and our friend, like I said up on that stage a few days before Fiesta: to a man who isn’t exactly here but is around here ¡Viva San Fermin! Gora. Now, onwards with the scribblings. From glorious ghosts of the past to friendly phantoms of the present. NOEL CHANDLER, DAVE PIERCE AND RAFAEL TORRES ARBIZU. Rafa Torres, with sash in hand. Los tres: the Gentleman that was Noel Chandler, the Joker that was Big Dave Pierce, and the Runner who was Rafael ‘El Gitano’ Torres, from Pamplona. I’ve already written about Noel and Big Dave before, over this past fiesta year, during their gentle dance from this Earth to that Fabled Fiesta in the Sky, so I won’t repeat myself again, suffice to say you can read about them both here, and here. But while we’re here I must just say something about Rafa Torres. I never knew him but I did know of him, of course, as he was one of that group of runners who I aspired to be like when I first went in 1984. 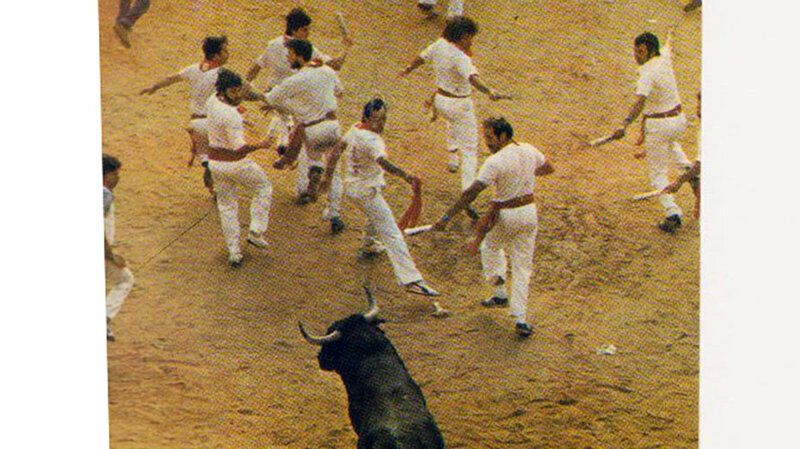 From the 1960’s to the ‘90’s he was a true bull runner, and he was from that evocative era when just about everyone ran in red and white, as you can see from the wonderful photo below. He’s the chap citing the bull with his faja, the red sash. Rafa Torres, with sash in hand, as he’d lost his newspaper during the run, with Madina to his right. 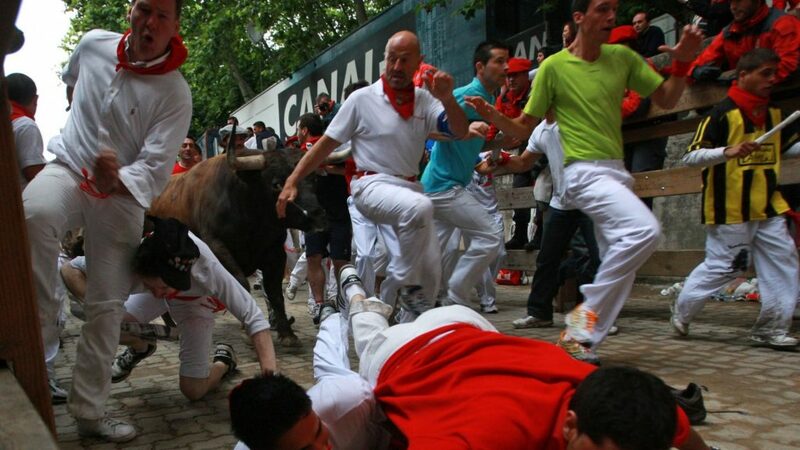 A truly moveable feast of a photo, and a perfect San Fermin encierro symphony in red and white. From the very start, where he began with, “The enormous heart of the old Welsh lion, spent from so much living, has finally stopped beating…” to the very end, ‘’There’s nothing more to say, only that we love you very much, Mister Chandler…always. See you soon, my friend. Safe journey…” he caught the mood wonderfully and emotionally, while not forgetting the other two, either. Fantastico, Fer Min Txo. Finally, once again one has to thank that dynamic fiesta duo Bunny, and JJ (he’s nicknamed ‘Dance-Dance’ although for the life of me I can’t imagine why,) Centurion, as during a trip to Pamplona for last New Year’s Eve, they asked the previous Pastor at the church, Padre Santos Villanueva, to schedule a mass for Noel. Then when Big Dave died this year he was naturally added, and Joe Distler asked for Rafa to be included too. Such is the wonderful big Pamplona family we are so lucky to be a part of. The mythical Canito, when he received recognition from Kukuxumusu to mark his 100 years. I know, I know, this is becoming a parade of the passed, but I have to mention just one more man. 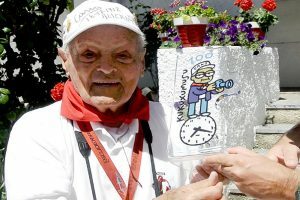 To quote the online version of the ‘El Mundo’ newspaper, of Wednesday 27th July, ‘The mythical photographer Fransisco Cano Lorenzo, at 103 years of age, has died in the early hours of this Wednesday.’ Yup, 103 years old…and over 70 of them photographing the world of the bullfight. No, I’m not really an aficionado and I didn’t know him but I’d like to mention him. He lived an extraordinary life immersed in the world of toreros, toros and corridas, and although I’m not qualified to go into it, I wanted to write just a little about him. 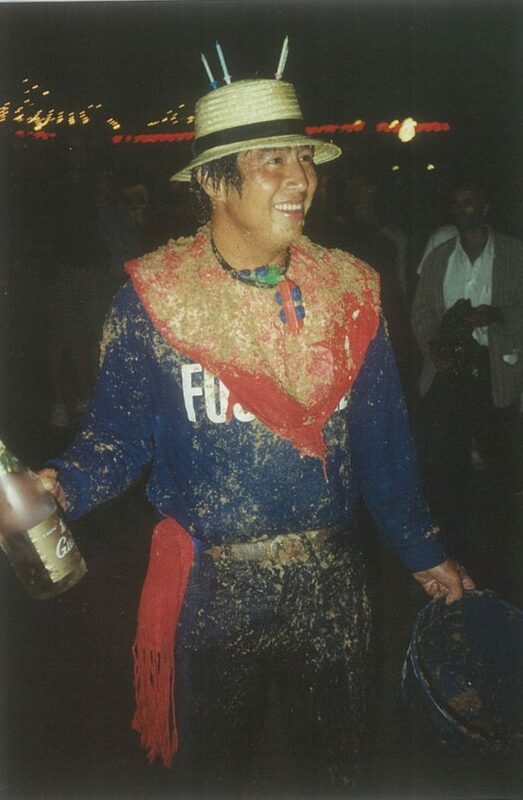 To remember a man who contributed much not just to fiesta, but to so much more in the wider taurine world…and also, for those who had never heard of him but are interested in these things, well, they now have another name and piece of history they can look into. Too many families and friends have lost too many special Sanfermineros this past year (the fabulous El Guti died, too, and you can read his about his unique fiesta contribution here. Fiesta and el mundo taurino have lost some extraordinary folk, but such is life, sadly. To you who gave so much during Fiesta, gracias. I wonder, how does Paradise photograph, Mr. Cano? I’ll bet with all the beauty of Earth, plus with some colours unknown to us that you’ll capture magically on film. And so to those mozos and maestros Rafael, Big Dave, Noel and Julen…may you not only Rest In Peace when you so desire…but Run In Paradise too when the mood takes you. Our beloved City Without Equal will miss you forever. 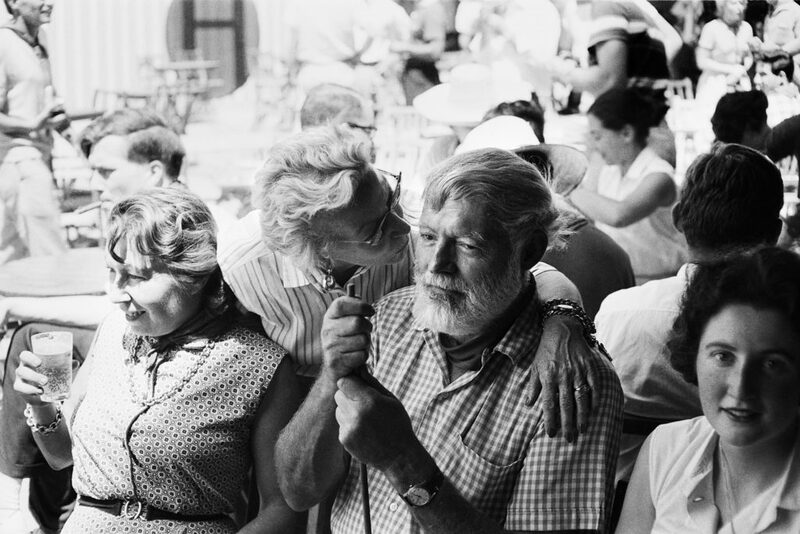 Hemingway in Pamplona, 1959. 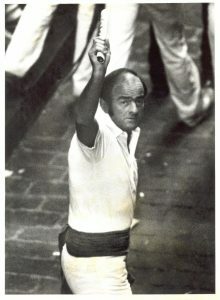 Julio Ubiña. Here’s one of those interesting (to me) snippets of fiesta history that I’ve been meaning to write about for a while, and now seems about the right time to pop into the past after the above catalogue of present day San Fermin sadness. 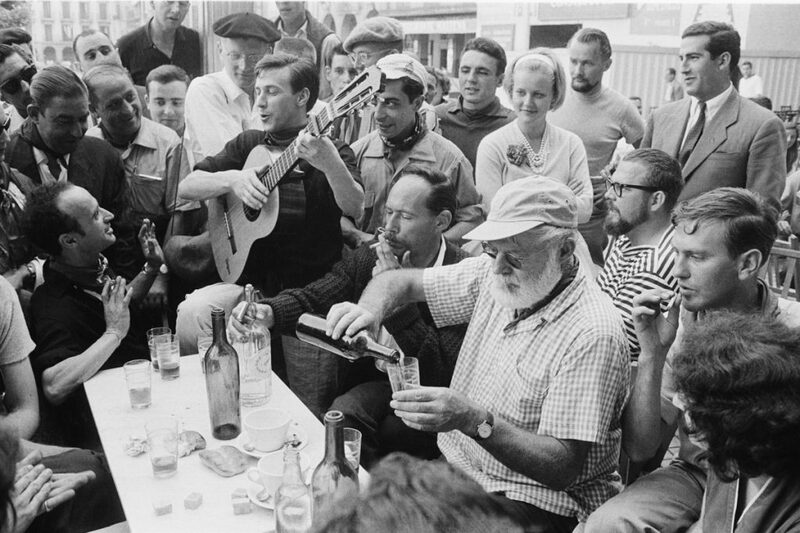 Before the 1959 fiesta, due to a slight mix up, Hemingway and part of his entourage had nowhere to stay. 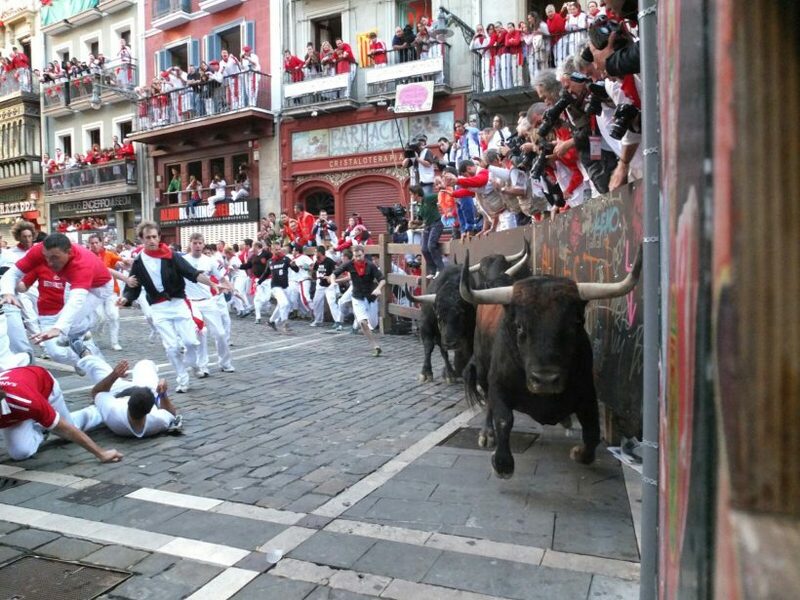 I’ve read many reasons why, in various books by a wife, an editor and even a daughter-in-law, about what might have gone wrong, but suffice to say San Fermin was approaching and they were homeless for fiesta. … In ‘Running With The Bulls’ by Valerie Hemingway, (she later married one of his sons, Gregory) there is a clue that maybe Quintana was in charge of organising a few things. Valerie Danby-Smith, as she was then, was a young Irish journalist working in Madrid in 1959, and who that May had managed to get an interview with Hemingway. He invited her to join his crowd and come to San Fermin, even asking Quintana to get extra corrida tickets and a room for her. Mary and Ernest, with Valerie on the right. Julio Ubiña. She still wasn’t sure about going, but one mid-June day as she was walking past her former residence, the concierge ran out, informing her that a letter and a package had arrived for her. It was from Quintana, saying that he’d made a reservation for her in Pamplona, and that if she couldn’t come, could she let him know by June the 15th? It was now June 16th. 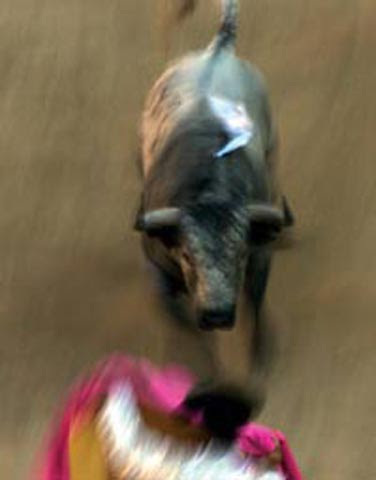 That decided it for her, fate took over, and she was now a part of the Hemingway cuadrilla, his ‘party’ or ‘gang.’ In a nice touch, the package that Quintana sent her contained a copy of Inge Morath’s book, ‘Guerra a la Tristesse,’ a book on bull-fighting. I don’t know why, but I’ve always liked what I’ve heard about Quintana, and that little kind act just adds to my admiration. Apparently Ernest had asked Quintana to send it to her, so she could learn a little about fiesta, and whatever the truth about any mix-ups with the accommodation, he got the book to Miss Danby-Smith. So no mention there either of any mix up, but it does seem Quintana had been asked to arrange some things and why not, as he was an old friend of Ernest’s and a native of Pamplona. Whatever the truth, pre-fiesta the Hemingways, and their friends, Bill and Annie Davis, the American couple at whose house near Malaga they were based at that summer, were heading to Pamplona via some other bullfights but would apparently be homeless when they got there. However, a small house was found for them quite quickly, and so just before fiesta the Hemingways’ and the Davis’s soon found themselves ensconced in the aptly numbered and named, 7, San Fermin Street. I doubt even Ernest himself could have made that up. And from now on the story gets a lot clearer, thanks to an article written by A. Ollo, that appeared in the special fiesta supplement from the Diario de Navarra newspaper of July 5th, 2009. Hemingway at Bar Choko, (as it was spelt then) in 1959. 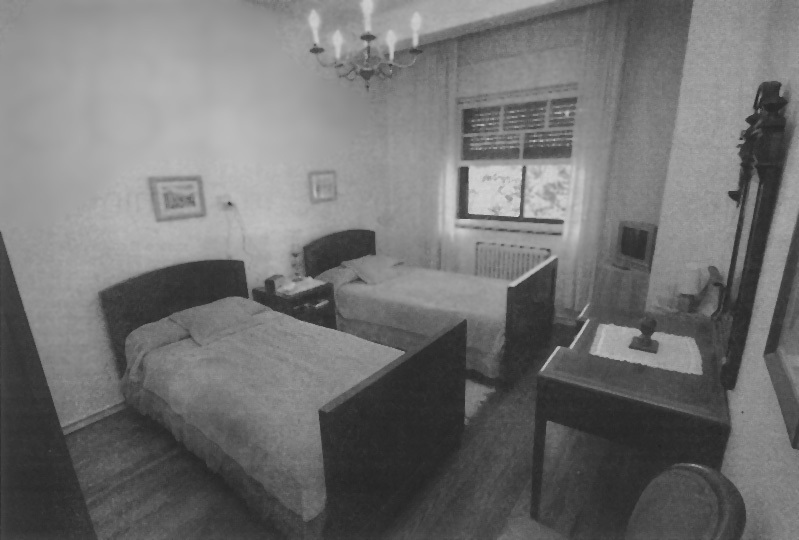 Whatever the mix up in accommodation, the house for that San Fermin nearly sixty sunlit summer’s ago was owned by a friend of Quintana’s, Jose Arrieta Lara, who lived there with his wife Patrocinio Mendizabal, and their four daughters. The newspaper article makes no mention of any problems that the Hemingways may have had with accommodation, or any failure on Quintana’s part, only that Ernest’s old friend wanted to surprise him. The article goes on to say that Quintana was helped by one Rosalia Guerendain Larrayoz, part owner of a rather well known Pamplona restaurant that Hemingway frequented. Did I say ‘part owned?’ Yup, the other part owners being her eight, yes eight sisters, and whose collective nickname was ‘The Darlings’ which thus gave the restaurant it’s unofficial name. Properly called ‘Hostal del Rey Noble’ it was more widely known by the nickname given to those nine sisters: ’Las Pocholas.’ Yup, ‘The Darlings.’ And with that house, so close to the bullring and by Half Moon Park, (surprisingly, still a little secret unknown by many foreigners, it seems to me) well, he must surely have provided that surprise. And as for the address, drunk or not…how could anyone forget that? The only slight problem was one of space, as Hemingway also wanted a writing room, but with some rearranging of rooms, beds and mattresses, etc, a bit of furniture borrowed from relatives and making use of the dining room and basement, the Pamplona family managed to remain in their house while the Hemingways and their friends Bill and Annie Davis were all put up to everyone’s satisfaction. So a bit crowded it may have been but everyone seems to have been happy and Hemingway got his writing room, too. 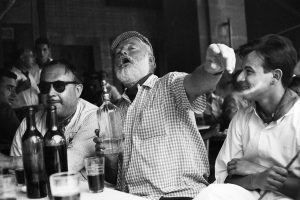 Quintana supplied ice every day for the great man’s drinks as there was no fridge, and breakfast was included in the price but apparently Hemingway never took it. He was always first out of the house, either to go to Bar Choko, (as it was spelt then) or to watch the encierro…and sometimes no doubt both. I haven’t seen that wee house on any of the official Hemingway tours, although I could be mistaken, but every time I pass the house I say a little thank you to him. The magnificent bust of Hemingway in front of the bull ring is great and imposing and is where many folk obviously go to pay homage, or just to give a nod and a wink, or raise a glass to say ‘salud’…but my little spot is an almost forgotten house where, for all his many faults, a great man, who essentially brought us all here to this magical town, was, even though he didn’t know it then, to spend his final ever San Fermin. Muchas gracias, y salud, Don Ernesto. ‘Guiri Day!’ and the Guiri of the Year Lunch. Señor Pinks, (in green) with Mister Testis, (in blue) and assorted lawyers, attorneys and churros makers. As many people know, for many years now, (this year was the thirteenth,) Those Magnificent Madmen and their Kukuxumusu Machine have chosen someone to be rewarded as their Foreigner of the Year. There is no real criteria to be given it, you just have to go to Fiesta, love Fiesta, or just have some connection with it…really, it is just Kukuxumusu’s choice. Now, for those who don’t believe, as I’ve mentioned and written often enough practically since I started writing these articles, that ‘being the centre of attention isn’t really my thing,’ let me tell you that’s the truth. It’s one of the reasons I had asked not to be chosen as the GdelA for several years now when the subject was brought up. But this year, for reasons too unimportant to go into here, when I was offered it…well… I had to accept. Despite my natural shyness and media-phobia…actually, it’s not a ‘phobia’ it’s just that I think there’s too much of it and too many people seem to want to be seen, or known, or famous or just be some kind of ‘celebrity.’ There are a few reasons why I said yes, but the main one was just to say thanks to all the inmates at the Kukusylum who have been so nice to me over the years, from every shop worker all the way to the (big blue) boss, Mr. Testis. 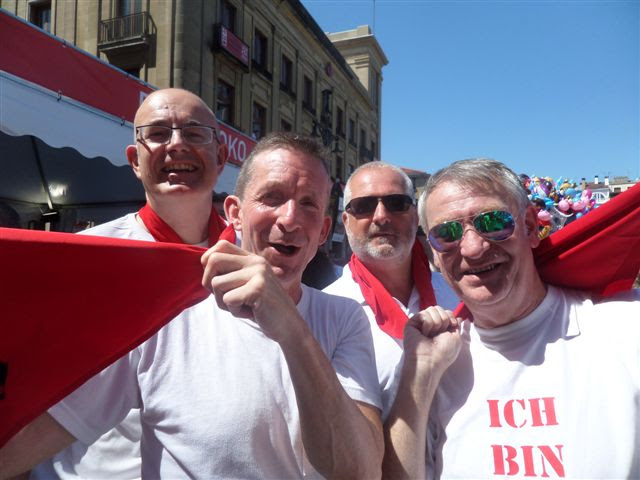 But especially to those who didn’t just encourage me to write articles for Sanfermin.com, (thank you Koldo) but those who have had to put up with my ugly mug showing itself all the time on the premises. Thanks especially have to go to Manu who has had to deal with me and my computing neanderthalismic numbnutting nutjobbing numptyism (yes, these are all real words, all taken from the Libyan – Basque Dictionary that I’m currently compiling.) He has been a patient and kind fella these last few years putting my articles together from the jumbled jigsaw of scribblings and shots (and awful if artful alliteration) I send him…but best of all he has become a fantastic friend. Now, without going into the politics of things, and the why’s, why nots and wotnots, there were, as many of you know, two Guiris of the Year this fiesta, awarded by two different companies. Basically, Kukuxumusu were taken over, some people left, but one of the original three who founded the company, Mikel Urmeneta, the comic, cartoon, and design genius, has started a new one, Katuki Saguyaki, and he wanted to also continue with the award and keep the original name ‘Foreigner of the Year’ too, but use it with his new company. Yup, one guiri was a popular foreign Sanferminero who has being going for decades, is well known in Pamplona and indeed around the world for his work, (indeed, his ‘art’, for that is what it is) due to just how good it, and he, is…and the other was Jim Hollander. Just kidding folks…and sorry Jim! Jim Hollander thoroughly deserved his award…(congratulations again, fella!) as he really is well known in Pamplona, had a photo of his chosen for the feria poster in 2002, and apart from being involved in a couple of other books, has also had a couple of his own published, including that classic Pamplona photo-book (but read the words from the various contributors too, they’re superb) ‘Run to the Sun’ and the most recent, ‘From Pizarra to Pamplona,’ which I read pre-fest and brought with me to fiesta to ask Jim to sign for me. Which he did, along with a lovely inscription. The 2002 Feria poster, using Jim Hollander’s photo. Jim Hollander is a Sanferminero through and through, a true aficionado to hoof, along with being a world respected and renowned international photographer. Not bad, eh? And thus it goes without saying, but a richly deserved Guiri of the Year also. So, two Foreigners of the Year. I hope in our different ways we complimented each other. Oh…and me? Oh…dear. I’ve written a few articles from things I’ve read, robbed and plagiarised, and self-published a couple of wee tales but that’s about it. 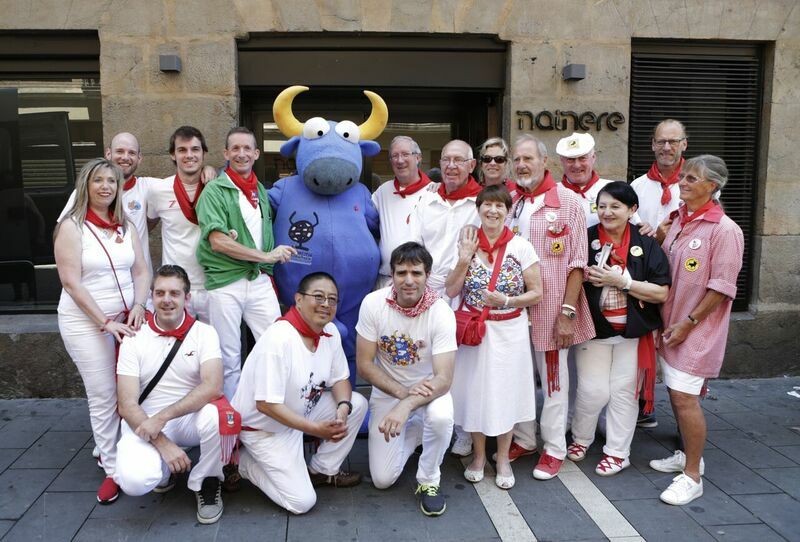 Oh, there is one more thing though…I do love, love, LOVE Pamplona very, very much. I love its people, its saint and its fiesta to the moon and back…and that was enough for me to be awarded Kukuxumusu Guiri of the Year. Or it could have just been for my staggering good looks. And do you know what? It was an honour, a pleasure and just a bullring shaped (all round) great fun-filled fiesta thing to be awarded and be involved with. Yes, even the media stuff was a hoot, although some folk who saw my ugly mug must have wondered what the heck El Hombre Elefante had to do with fiesta…anyway…I’m sorry you may have had to contend with my unedifying visage on the tele, (jeez, I’ve actually been told that I don’t even have a face for radio!) or in the papers here and there, but remember, it’s always glass half-full time for me, fiesteros…so it was only for a smidgen of those 204 glorious hours of fiesta. So once more my thanks to Kukuxumusu, and especially Manu, for choosing me as their Guiri del Año. Hope the cheque didn’t bounce, fellas. Thanks for a great Guiri Day Lunch at the Nainere on Saturday 9th where there were about 50 people attending and I met many other previous GdelA’s, some of whom I knew, and some I didn’t, but where it was obvious that to actually win the thing you have to be slightly off your rocker. Ah, yes, being ‘off ones rocker’ reminds me to thank my personal invitees who ditched whatever they really wanted to do and came along in support. At least, I hope it was in support, ‘cos I actually think they came not just a free lunch but loads of free alcohol, too. Heck, why do you think I showed up?! Salud, Sanfermineros, I truly appreciated it. Before I go, a couple of other things happened that made it a truly unique fiesta. I might even include a photo or two… (Look, as I’m talking about me for once I might as well take advantage and dilute a couple of pictures that I’m in with the friends about to be mentioned below.) 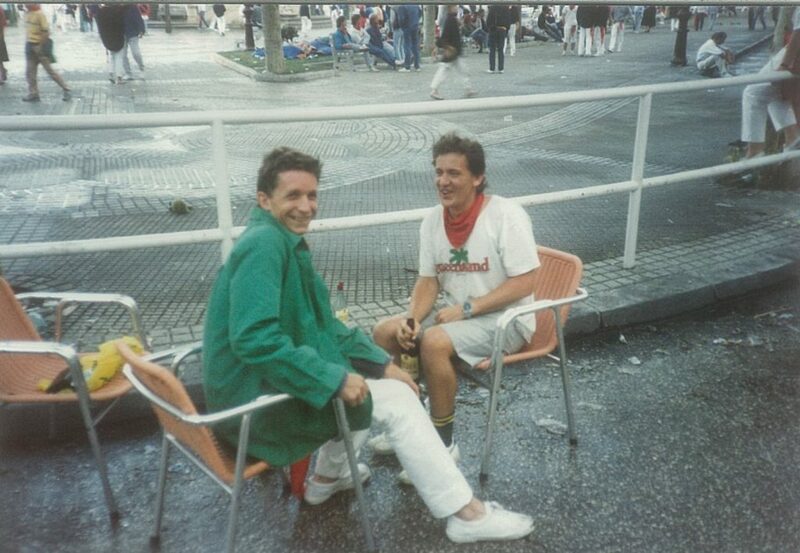 Back in ’84 when I arrived for my first ever fiesta, little knowing it would be the beginning of a life-long love affair, one of the people I met on the patch of grass opposite Bar Txoko, where the gang I fell in with basically lived for the whole of fiesta was also there for his first year. His name was Ike del Rosario (it still is) and he’s from California. He remains a great mate and one of my favourite people on the planet, but after the first ten years or so he hasn’t been able to make it back due to, well, life. He made it for New Year’s Eve once, (where he dressed up as Elvis…think ‘Filipino Elvis!’) and I think one more fiesta around 15 years ago. Actually, 1999 rings a bell. Anyway, before fiesta the gang were in San Sebastian, and imagine my surprise and deep joy when, around midnight, in Constitution Square in the Old Town…there was Ike. Unbelievable. A couple of people knew but had kept it a secret but I had no idea. It all added to the magic of this year’s fiesta. James and yours truly, in the gutter. Or perhaps that should read, James and me, truly in the gutter?! The Reigate Hillbillies. 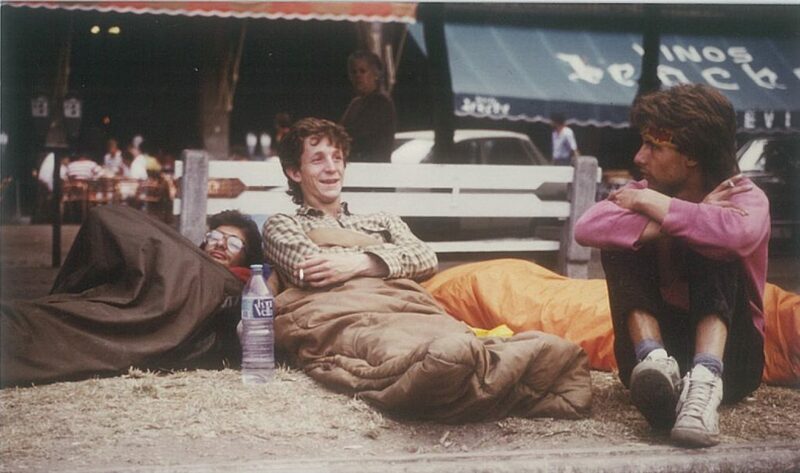 Mark, me, Tim and Alan, seconds before the town slips off it’s axis for 9 days. To everyone who had the good grace and just all round sense of fun to say congratulations or ‘felicidades’ to me for being Kuku’s Guiri of the Year…thank you. Just like the unknown folk from Pamplona who stopped me in the street to say something nice, or even to take a ‘selfie’ with me…you ‘got’ it. Thank you. (I know, I know…people wanted a selfie with me, for fiesta’s sake!) I was hailed by complete strangers who laughed with me, joked with me and drank with me. Like I said, Pamplona really does slip off it’s axis… What fun. ‘Cos that’s all it is about, being Foreigner of the year…a bit of publicity for the company, of course…but a whole lot of fun for the victim…me! And I have my ‘trophy’ proudly placed in the living room, and I’m going to keep my special kuku-tiara on until next year’s Guiri Day Lunch…when, even though they will have chosen the 2017 GdelA in June, I shall proudly, and officially, relinquish my crown, and pass it on to whoever is lucky enough to be the next San Fer King or San Fer Queen. Well, we are just about there, chicos. That’s nearly the end of this, and it’s certainly enough of me. The next puli, (for that is what these articles are called) will be back to the happy normal – almost nothing about me but mostly loads about everything else. In certain photos the streets of Pamplona appear to be lined with gold, but of course the Fiesta of San Fermin can’t be all silver linings. Fiesta may seem like a fairy tale sometimes but it is real life too, after all. But during what was, in one small way, ‘my year’ I felt like I was treading on cobbles made of gold lined by pavements edged with silver. Pamplona, I love you. You’re a dreamland, the pot of gold at the end of the rainbow, heaven on earth, and as a city you’re the genie out of the bottle, with dancing giants, magic people and running bulls. Pamplona and Fiesta is a magical, mythical marvel and inhabited by some of the best people on the planet and I’m a lucky lad and we’re a lucky bunch. This video of the entire La Pamplonesa pre-fiesta concert in front of the Town Hall is for everyone, but especially for the maestro, mozo, borracho and golfo and all round huevo bueno and mi amigo, Rolf von Essen. ¡Ya falta menos! ¡Viva San Fermin! Gora!